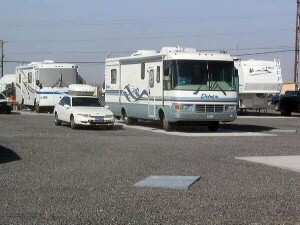 Nice military RV park, overall but the $30 rate is overpriced compared to other locations. We made reservations 13 Jan 2017 and we were quoted $25 rate but was $30 upon check-in. 30/50 amp full hookup on new 50 ft concrete pads. Everything else is gravel. There is plenty of adjacent gravel area between sites to park your toad or towing vehicle. There is a very nice laundry facility co-located with the men's and women's latrine/shower. Wash (two machines) is $1.00 and dry (two machines) is $1.00. No picnic tables at each site bit there is a central picnic barbecue area next to the laundry/shower building. There is a pet area on the north side of the RV park but no grass, so your pet needs to have a sense of humor! Unfortunately it seems that many residence were homesteading with permanent decks, residential propane tanks, junk laying around, etc. Many do not heed the dog leash rules and several occasions of large dogs running around our site. If there is a camp host they never made themselves known. Amenities are good as others have mentioned. We were very impressed with the NEX and Commissary as they looked fairly new. Although both are a little small they are very well stocked. There is no Class Six, alcohol is in the NEX. Movie theatre right across the street. Bowling alley a block away and they deliver pizzas and other items. Security Forces routinely drove by. Jet noise is prevalent, but reminds us of how lucky we are! Overall was a good stay.